Bristol is in the heart of Murder to Measure's beat, and as a bustling and vibrant city if offers many locations suitable for grisly deeds. If you want a murder mystery in Bristol, with historical roots stretching back over the centuries, it boasts a fine array of cultural, historic and entertainment venues that can make a weekend pass all too quickly. The following list shows some venues that we have used for either public or private murder mystery events in Bristol. This is only a partial list of possible venues; you are welcome to choose your own venue or let us find one for you and your party. 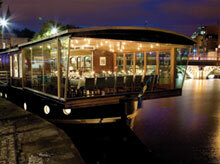 Glass Boat in Bristol is an unusual venue moored in the city centre. The private dining room below the main deck will seat up to 40 and features a polished wooden deck, sculptured oak surrounds and portholes lining each side of the hull. The Avon Gorge in Clifton is a hotel close to the city centre. It offers stunning views over the Avon Gorge from its all-weather terrace. It has a variety of rooms suited to private dining with a range of menus available from £15.00 per person, with complimentary room hire. The Ship Inn in Alveston , near Bristol, is a Tudor coaching inn dating back to 1589 set within three acres of rolling countryside. It has five function rooms catering for up to 100 people and a neighbouring Premier Inn can provide accommodation. The Cosy Club in Bristol in the heart of Bristol has a private dining room, the Peacock Room, which can seat up to 20 people for a mystery dinner. There is no room hire fee, but a minimum spend requirement. River Cottage Kitchen in Bristol is housed in a restored Grade II listed 19th Century church building in the Clifton area of Bristol. The private dining area is set on the first floor and comfortably seats up to 12 for lunch or dinner. The Bristol Cookhouse in Bristol combines a fully equipped food studio, beautiful private dining club and vibrant weekday canteen with open-plan kitchen. The versatile studio space is also available for workshops, cookery classes and training sessions. Rummer Hotel in Bristol occupies a listed building in the Old City Quarter. It is an independent bar and restaurant with a passion for quality. An inn has stood on the site from the 1200s. The hotel was refurbished in 2005 and now boasts a classic stylish interior. The main entrance has been restored to All Saints Lane, and the Cellars converted back to an intimate venue, and private dining room. The Milk Thistle in Bristol is an exclusive venue for the discerning featuring a cocktail bar, lounge & private function rooms. The Attic, on the top floor, is perfect for dinner parties of up to 18 guests and hire is free subject to a minimum spend on food and drink.